Whether you're going on a vacation or will be away from home for a while, the United States Postal Service's Request Hold Mail service is a great tool to use to protect your mail. 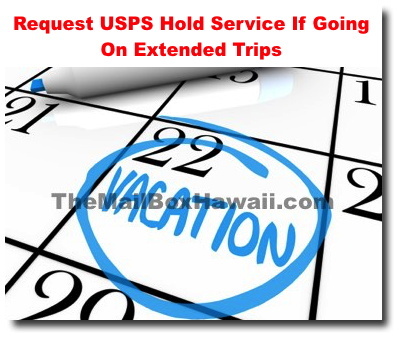 USPS will keep your mail at your local Post Office until you come back. You can schedule the Hold Mail service up to 30 days in advance, or by 2AM Central Standard Time (between Monday to Saturday) on the date you want to start your mail hold. To complete an online Hold Mail request, visit USPS.com. You can select the start and end dates of when you want your mail held. USPS can hold your mail between 3 to 30 consecutive days after which they will deliver all your held mail.